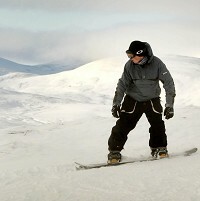 You're never too old to learn how to snowboard, according to travel writer Sue Attwood. The 58-year-old Daily Telegraph writer assured thrill-seeking readers that taking to the slopes is a doddle with practise, even if you're not in your youth. Despite being the oldest person that her instructor had ever taught, within three days Ms Attwood said she was boarding like a pro, zig-zagging down the slope with ease. The first day at the Swiss ski resort of Abelboden involved learning how to stand on the board while moving around on a flat surface. She was then guided down a small assent down the hill. Day two saw a fair bit of toppling, but by the afternoon she was starting to get her head around the sport. Armed with seniors travel insurance, there's no reason you can't take to the slopes as well. "Once you get the hang of the lift though, and crack the first few hard days of lessons so you don't fall so much, I imagine it's a doddle… yes, even at 58," she wrote.